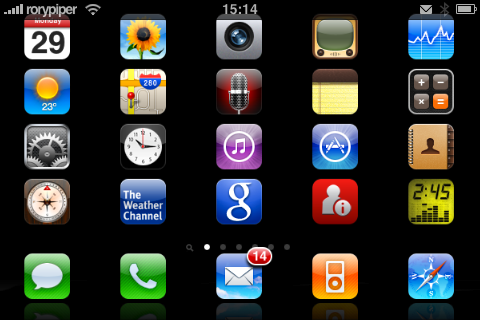 DeveloperÂ limneos has released a new tweak for the iPhone and iPod Touch called â€œSpringBoard Rotatorâ€œ. This new tweak brings a little bit of the iPad to the iPhone, in that it allowsÂ landscape mode for your entire iPhone interface. Not just within the apps, but on all the springboard pages. Similar to the iPad, you can turn your iPhone anyway you want and the screens follows you. It includes full support forÂ Infiniboard, Infinidock, Iconoclasm, Five Column Springboard,Â Shrink, and more. You can control your backgroundÂ image, when rotating. Have it zoom in, crop, use your lock background, or have it not rotate at all. To use a different background while in landscape mode, place a 480 X 320 image in /User/Library/ and name it â€œLockBackground-Wide.jpgâ€.Â You can also adjust your iconâ€™s behavior; icons will always shrink to 70%, but you can make the dock icons not shrink at all. Alternatively, let the â€œShrinkâ€ app handle this. There are currently a few glitches that the developer is working to fix. You must have at least one icon on your dock for this to work, at all. Also, Stacks is not currently supported. There have some reports of SpringBoard crashes, as well, but I have not had any of these issues. If you come across any issues, you can report them to @limneos, on Twitter.